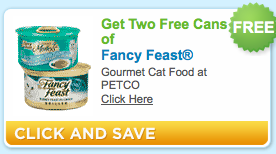 Coupons.com has loaded a coupon for two free cans of Fancy Feast cat food at Petco. (You can get to it easily by clicking on “pet care” on the left hand side. The coupon is unusual as it is only valid June 25-26, 2011.